This is exam preparation for those who want to achieve the prestigious ASQ Certified Six Sigma Green Belt (CSSGB) qualification. Combining intensive classroom training with unlimited access to an online exam simulator for 365 days, this programme is designed to equip participants with an understanding of the Certified Six Sigma Body of Knowledge, confidence to apply these skills effectively, and the knowledge required to pass the ASQ examination. This course is for those with experience in lean and six sigma tools. It is only available for in-company bookings. If you would like to attend a public course as an individual, or don't meet the ASQ eligibility requirements, why not take a look at our Lean Six Sigma Green Belt Course? What are the Key Benefits of this Programme? This is an in-company programme, meaning that we deliver training exclusively to your team at a venue chosen by you, and on a date that works with your schedule. This minimises any disruption to your team’s productivity levels. Although we adhere to the syllabus required to cover the ASQ Certified Six Sigma Body of Knowledge, we can tailor the focus of the programme to be most relevant to the processes and challenges of your organisation. The content covered during this programme will develop each participant’s skill as a process improvement specialist. Taking their skills to the next level will increase the positive impact they can have on the profitability and quality levels of your organisation. By attending the same training, everyone who works on process improvement initiatives within your organisation will gain a consistent level of skill, and a common terminology for six sigma tools and processes. This increases efficiency and improves clarity in communications. 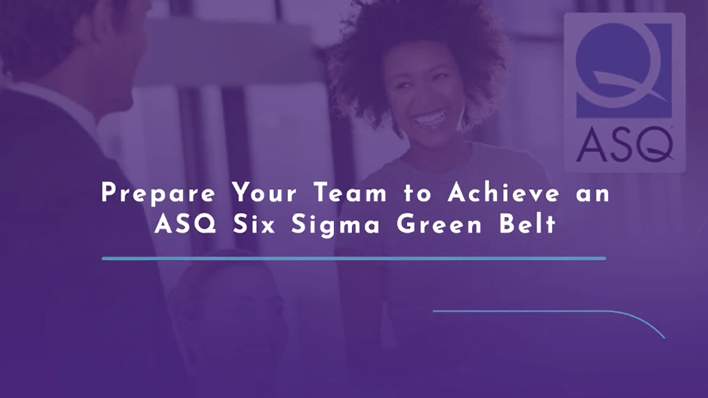 This course is designed to equip your team with everything they need to pass their ASQ Certified Six Sigma Green Belt exam first time. During training, we cover sample questions and answers. Once training is complete, each participant gains 365 days of access to an online ASQ exam simulator. The ASQ Certified Six Sigma Green Belt qualification is known and respected at a global level. By certifying your team at this level, you are raising the bar for the standard of improvements and process quality in your business. What is Covered on this ASQ Green Belt Programme? What are the ASQ Six Sigma Green Belt Eligibility Requirements? Participants require an aptitude for data analysis and statistics. Participants must have a minimum of 3 years working in a process improvement environment. This must encompass utilising at least 1 of the areas in the Six Sigma Green Belt Body of Knowledge (Define, Measure, Analyse, Improve, Control). This must be paid working experience. Internship, coursework, or any other kind of unpaid work experience will not meet the ASQ eligibility requirements. Unsure if your team meets ASQ eligibility requirements? No problem! We offer a range of Lean Six Sigma certification options. Get in touch with us by Freephone on 1800 910 810, or click here to Ask A Quick Question. We'll be happy to advise on the right fit for your organisation. 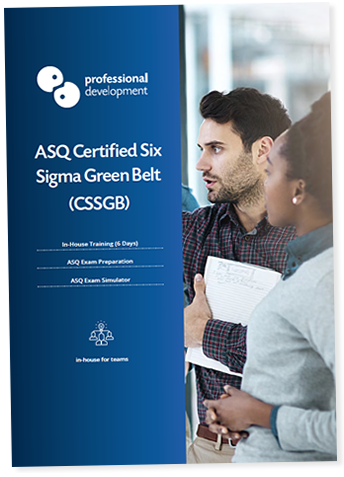 Our ASQ Six Sigma Green Belt programme is only available for group or in-company bookings. Our Lean Six Sigma Green Belt Course is an excellent alternative for those who are seeking to achieve a green belt certification through training as an individual. What is covered during this course? Guidelines and tips for your certification process. You can visit the main course webpage for our Lean Six Sigma Green Belt Training by clicking below.